Perfect for anyone wanting to camp, get outdoors and stay on a budget. These cabins are lower priced and considered Cost Efficient for various reasons. Please carefully read descriptions on each. Some are full service cabins, one has no water or plumbing, another is strictly a place to stay dry and off the ground. Great opportunity for hikers, climbers or small groups looking for a clean, dry place to lay your head, recharge your electronics, take a shower, enjoy a tv show. Cabins are small, (read descriptions) well maintained and clean. Fern Valley Cabins come with all the basic amenities; oven/stove, mini fridge, microwave, A/C unit, electric heat, small tv with 3-5 channels and dvd player. Mt View and Mt.Hideaway are full service cabins with all amenities but outdated decor and furnishings, but a great way to save a dollar. LIttle Wood Cabin is cute and secluded but has no water but provides an outhouse! We ask you to bring your own bath towels. Fern Valley Cabins are on well water which causes a sulfur smell. Although the water is safe, it is advisable to bring drinking water for drinks and coffee. There is a two-night minimum for cabins. Groups that like to camp can use the 1 acre campground across the street from the Fern Valley Cabins. Campground comes with 3 charcoal grills, 3 firepits, picnic tables, wooden swing and sits on the Red River with easy access. Canoes and kayaks welcome. Swim AT Own Risk, all water activities are at your own risk. Port A Let is available for campground. Campground rents for $25 a night for a group (4-5 tents). Campground can accommodate up to 6 tents and 1 lightweight pop up camper can park alongside cabin driveway. Not designed for RV’s. Individual’s can rent a camp spot for $6.00 per night per tent. Campground can rent separately from cabins but cabin renters are given priority on renting campground. Campground does have rules : Quiet hours are 10:00 pm-9:00 am, no loud music, no fireworks, no shooting of firearms. Must be considerate of people staying in cabins. DVD player and movies can be rented from our check in location at the Daniel Boone Coffee Shoppe and Deli. You will check in here for keys and directions. These cabins are lower priced and considered Cost Efficient for various reasons. Please carefully read descriptions on each. Some are full service cabins, one has no water or plumbing, another is strictly a place to stay dry and off the ground. Great opportunity for hikers, climbers or small groups looking for a clean, dry place to lay your head, recharge your electronics, take a shower, enjoy a tv show. Cabins are small, (read descriptions) well maintained and clean. 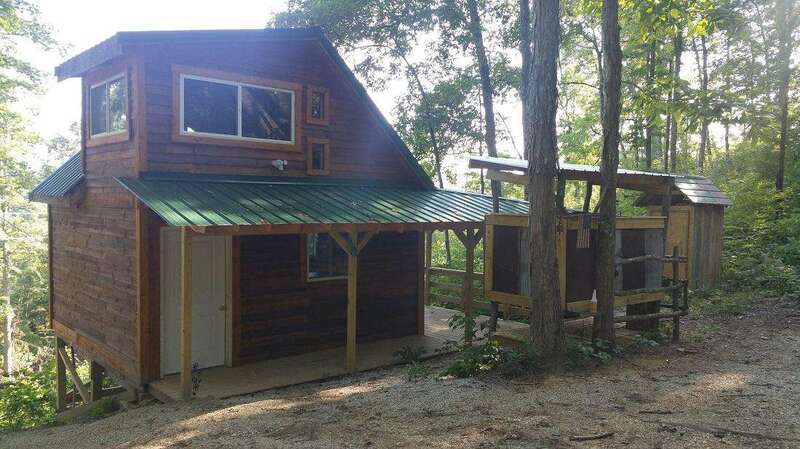 Fern Valley Cabins come with all the basic amenities; oven/stove, mini fridge, microwave, A/C unit, electric heat, small tv with 3-5 channels and dvd player. Mt View and Mt.Hideaway are full service cabins with all amenities but outdated decor and furnishings, but a great way to save a dollar. 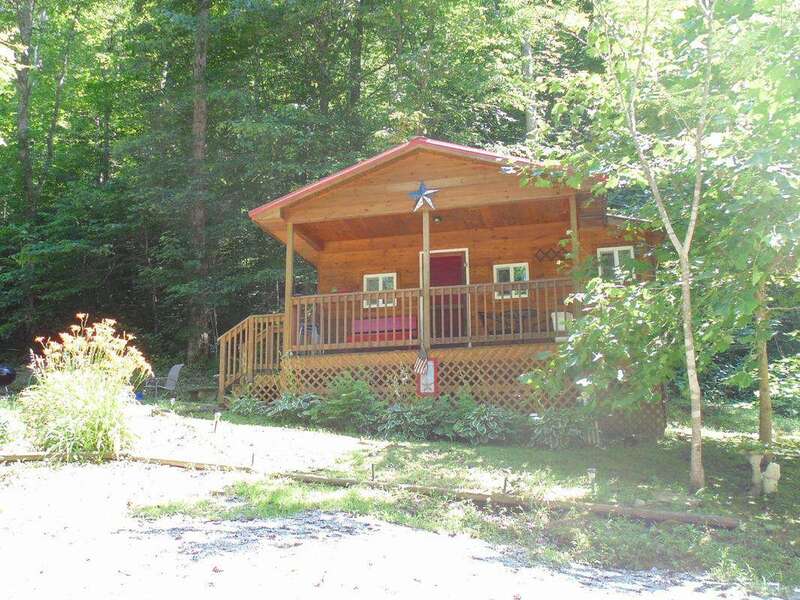 LIttle Wood Cabin is cute and secluded but has no water or plumbing but provides an outhouse! We ask you to bring your own bath towels. Fern Valley Cabins are on well water which causes a sulfur smell. Although the water is safe, it is advisable to bring drinking water for drinks and coffee. There is a two-night minimum for cabins. Small 100 sq ft covered shelter, with 2 windows, covered deck with bench, on middle fork of Red River. Charcoal grill, firepit & picnic table available. Camper cabin has 3 platforms for you to put a sleeping bag. Guest may use bathrooms located in the Daniel Boone Coffee Shoppe & Deli. Showers available for pay about quarter mile away. Conveniently located on Rt. 11 behind Deli & Coffee Shoppe so food and supplies are on premises. Pet Friendly but please keep pet on leash if other campers in the area. You must clean up after pets. Cabins have bed linens, dishes, utensils, glasses, cookware. Each cabin also has a charcoal grill. Each efficiency cabin has a set of bunk beds, futon bed, small kitchen table, and full bathroom with shower. Cabins are on well water which causes a sulfur smell. Although the water is safe, it is advisable to bring drinking water for drinks and coffee. Located in very scenic, secluded area next to the Red River. Great for folks who want to kayak, canoe or just float in the river. River is very slow moving and fairly shallow most of the time. There is a two-night minimum for cabins. Groups that like to camp can use the 1 acre campground across the street from the cabins. Campground comes with 3 charcoal grills, 3 firepits, picnic tables, wooden swing and sits on the Red River with easy access. Canoes and kayaks welcome. Swim AT Own Risk, all water activities are at your own risk. Port A Let is available for campground. Campground rents for $25 a night for a group (4-5 tents). Campground can accommodate up to 6 tents and 1 lightweight pop up camper can park alongside cabin driveway. Not designed for RV's. Individual's can rent a camp spot for $6.00 per night per tent. Campground can rent separately from cabins but cabin renters are given priority on renting campground. Campground does have rules : Quiet hours are 10:00 pm-9:00 am, no loud music, no fireworks, no shooting of firearms. Must be considerate of people staying in cabins. Mini, effiecency cabin. Comes with bed linens, dishes, utensils, glasses, cookware. Each cabin also has a charcoal grill. Each efficiency cabin has a set of bunk beds, futon bed, small kitchen table, and full bathroom with shower. Cabins are on well water which causes a sulfur smell. Although the water is safe, it is advisable to bring drinking water for drinks and coffee. Located in very scenic, secluded area next to the Red River. Great for folks who want to kayak, canoe or just float in the river. River is very slow moving and fairly shallow most of the time. There is a two-night minimum for cabins. An adventure in slowing down, Firefly is the perfect nesting spot for those seeking the soul nourishing benefits of returning to life’s basics. Build a fire in the wood burning stove and admire your handiwork, cook S’mores over the fire pit, or enjoy games/drinks on the screened in porch at dusk, when the fireflies work their magic. Gather around the kitchen whilst someone whips up a scrumptious meal, relax on the back deck and catch the sunset, or take in the morning with a hot cuppa on the screened in porch. Before you know it, you will find yourself realigning with nature’s pace and rhythms - and truly relaxing. Who knows? You might even discover that you enjoy washing dishes! As previously stated, the cabin is heated via wood burning stove. In cooler months, please ensure that someone in your party is capable of safely operating the stove. In warmer months, there are ceiling fans, window screens, and a portable fan for air circulation. Firefly runs on cistern water, so please be mindful of your water usage. The cistern water is safe for showering, washing dishes, and running the toilet, but it is NOT reliably potable. A water jug is provided for your cooking and drinking needs, but bringing plenty of additional bottled water is highly recommended. While soon to be equipped with wi-fi, there is NO microwave oven, NO toaster, NO television, NO bathtub, NO dishwasher, and NO hot tub. There are however, games, books, magazines, Kapla blocks, and a bluetooth speaker for your enjoyment. There is a mini-fridge for short stays, supplemented by a YETI Tundra 125 cooler for longer stays. We recommend you bring or buy your food before arriving at the cabin if you plan to enjoy cooking in the fully equipped kitchen. There is also a gas grill on the deck outside the kitchen. There are 2 bedrooms, each equipped with a queen-sized bed. While both the loft and the main floor bedroom offer privacy, neither has a proper, fully locking door. Please note this when booking. Sorry, our staff is unable to arrange to have cistern filled on short notice, and may be unable to arrange to have it re-filled before your departure. Please be prepared for water shortage. We highly recommend bringing plenty of drinking water. This is a cost effecient tiny cabin designed for folks who can live without water in a house. 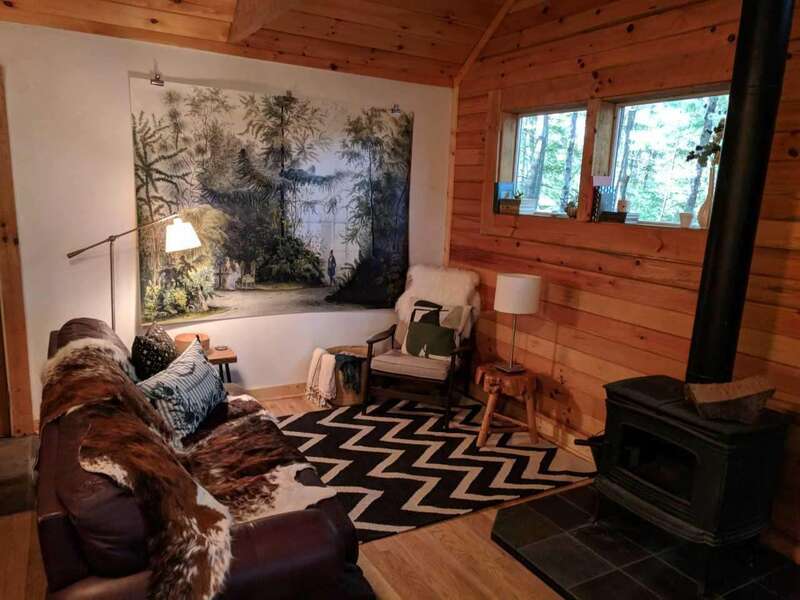 The cabin is modern otherwise, with electric, TV w/ DVD Player (No Satellite TV), heating and AC unit, nice queen size bed, modern living room furniture, refrigerator, small stove. Designed for climbers, hikers, campers who want nice place to sleep, stay dry, and charge electronic devices. Cabin does provide enclosed outdoor shower area for guests to bring portable solar showers and there is a true, authentic outhouse! However, please note cabin has no water and no plumbing therefore, no dishes, glasses or kitchen items. You may bring your own camp dishes or paper products. You must remove any food items, dishes and trash. Bring a cooler full of food and drinks and you do have the refrigerator to keep them cool. Does require 4 wheel drive to get up driveway. Please note this cabin does not provide water, it has no water source or plumbing. It does have an outhouse and enclosed outdoor area to hang a solar shower bag. Four Wheel Drive is required to get up the driveway to this cabin.